"CBS This Morning" may find its saving grace in Oprah Winfrey -- if she gives the thumbs up. Producers are clamoring to convince the talk show icon to step in for Charlie Rose, according to Page Six. Rose was fired from the show less than 24 hours after a Washington Post bombshell report exposed sexual misconduct claims by eight women. A rep for Winfrey said that she had not received a formal offer to join the program as of Tuesday. It took five years before producers could convince her to join "60 Minutes," which she did in September. Oprah out on the town at Tramp’s in Beverly Hills. Oprah attends the premiere of “Native Son” in a long fur coat. Oprah receives an award at the Bafta Film & TV Awards in the UK. Oprah poses in an all-black ensemble, accessorized with stylin’ shades and hat. Oprah poses with her People’s Choice Award. Oprah celebrates her People’s Choice award in a stunning black leather accented dress. Oprah is radiant in a red gown at the Legends Ball. Oprah during opening night of “Three Days of Rain” on Broadway. We love Oprah’s patterned gown at the 2007 Vanity Fair Oscars Party. Oprah wears a navy gown to the premiere of “Up In the Air,” pictured here with the dreamy George Clooney. Oprah would command a boardroom in this suit, but is still all-glam at the event to honor Glamour Magazine’s Women of the Year. We love that you can see that Oprah's fabulous shoes are Louboutins while she speaks about her network, OWN. Oprah and students at the Oprah Winfrey Leadership Academy for Girls in South Africa’s first graduation. Oprah receives an award from Ladies Home Journal, dressed in a red suit. Oprah in all black, posing with a cute pup! Oprah presents at the Oscars, with a tulle skirt flowing behind her. Oprah rocks a metallic lilac suit at the Daytime Emmys. Oprah, never one to shy away from color, dazzles in red. Oprah looking elegant at the 68th Annual Academy Awards. Oprah showing off those gams! Oprah rocks the sheer top to this dress, with accompanying jacket for added flair. Another lovely black gown, accompanied this time by a silver shawl. Oprah wears black lace while being honored at The National Book Awards. Oprah at the launch party for O Magazine. First Anniversary Party for O Magazine, Oprah rocks lime green. Oprah attends the Vanity Fair Oscars Party. Oprah wears a great scarf to the Oxygen 2nd Anniversary Party. Oprah took our breath away at the 2002 Primetime Emmy Awards. Oprah and Halle Berry are visions in white and black gowns. Oprah at the 2004 Academy Awards in a lovely metallic gown. Oprah poses in a sleek black outfit. Halle Berry and Oprah pose at the 77th Annual Academy Awards. Oprah is stunning in a pale gold gown. Oprah attends the Tony Awards in a belted navy gown. Oprah wearing a beautiful red dress with matching shoes. Oprah is elegant at the opening of her school for girls in South Africa. Elegant in a white gown, Oprah attends the CFDA Fashion Awards. Oprah makes red her color, wearing it again to the Primetime Emmys in 2008. Oprah rocks a grey dress at an event celebrating Women in Entertainment. Oprah looks absolutely beautiful in this dark blue gown at the 82nd Academy Awards. Oprah with Steven Spielberg, in a lovely flowing orange gown. 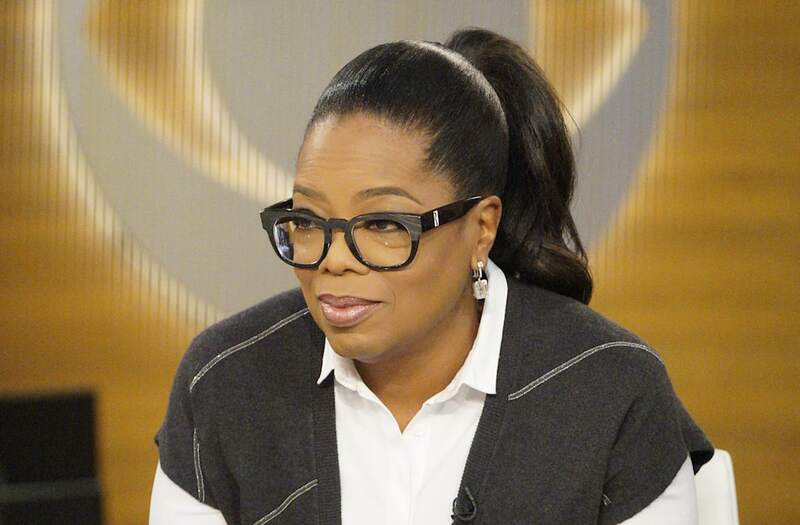 Though most often in black or brighter colors, we love this neutral outfit on Oprah. Oprah visits Australia in style. Surprise Oprah! At the Farewell Spectacular event, Oprah wore a long purple gown. Oprah speaks on stage in a bold yet lovely magenta dress. Oprah with Ralph Lauren, radiant in a red gown. Oprah at the 2012 Oscars, shimmering in gold next to Oscar himself. In a gorgeous green gown, Oprah attends the 3rd Annual Diane Von Furstenberg Awards. We love this mint dress that Oprah wore to the O You! Event, presented by O, The Oprah Magazine. Ravishing in red yet again, Oprah wears this color with style. For more on Style and Lifestyle, visit AOL.com. On Wednesday, CBS reported three more women -- all the company's own employees -- had come forward with allegations: "We learned about these cases not from the HR department, but from our own investigation of his behavior," CBS' news team wrote.